Temagami is located 60 minutes north of North Bay, Ontario or 30 minutes south of New Liskeard. 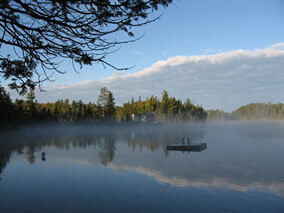 Temagami is very well known for its vast lake and Northern Ontario surroundings. The Anishnabai have been living in the area for at least 6,000 years after migrating from the east coast of North America. The land was divided into familial hunting and trapping territories. 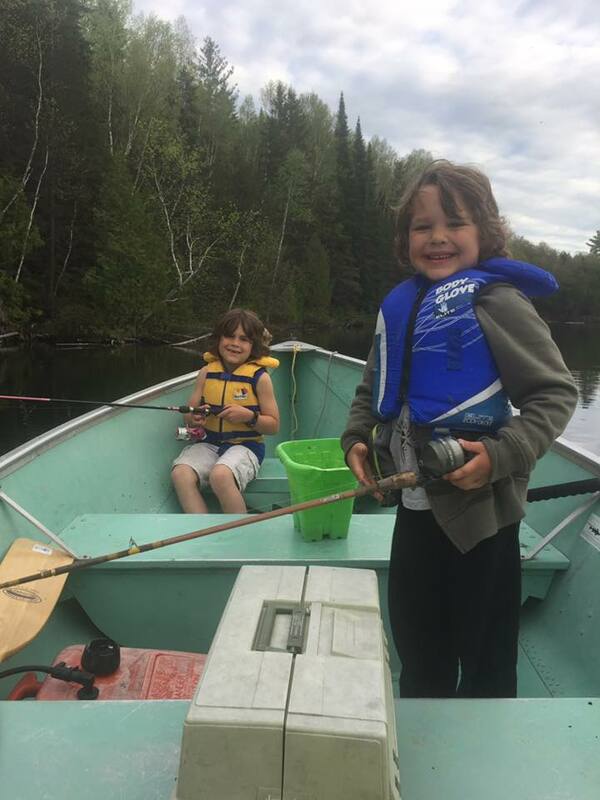 Fishing in Temagami is a big story (but not as big as the one that got away!). Most area lakes contain some combination of lake trout, walleye (pickerel), smallmouth bass, northern pike and whitefish. Splake, rainbow trout and speckled trout are also found in some lakes and rivers. While the lake trout and walleye fisheries have attracted the attention of anglers throughout the world, less attention has been paid to bass, pike and whitefish fisheries. These species provide excellent fishing and are growing with popularity with anglers. Since the main east-west fur trade route bypassed Temagami/Marten River to the south, settlement of this area by Europeans did not come until 1834. That year the Hudson’s Bay Company built a store on Temagami Island, Lake Temagami. The town itself was founded by Daniel O’Connor, who in 1903 formed a steamship company on the lake and established its first store on the future town site. By 1906, he had built three hotels on Lake Temagami: Hotel Ronnoco, Temagami Inn and Lady Evelyn Hotel. In the summer of 1905 the Temiskaming and Northern Ontario Railway, now renamed the Ontario Northland Railway, was completed from North Bay to New Liskeard and allowed easier access to the area and the “Great Clay Belt” around Lake Temiskaming. Discoveries of gold, copper, nickel, and particularly silver in 1903 brought mining to nearby Cobalt and accelerated development of the region. Several mines opened around Temagami, Ontario. Some of these mines were Sherman Mine, Kanichee Mine, Harris Mine and Copperfield’s Mine, which once mined the richest copper ore in Canada. The Forest Reserves Act of 1898 established the 15000 km (5900 square mile) Temagami Forest Reserve. Because of this reserve, the region was home to the last old growth forests in Ontario. Logging of the vast pine stands only began in the 1920s. Now just a few patches of old growth remain, including the White Bear Forest (12.42 km) and the world’s largest stand of old-growth red and white pine forest – the Obabika Lake Forest (25 km). This has led to confrontation in recent years between loggers and environmentalists when new logging access roads are built or major logging operations are proposed. Access to many old-growth areas is provided on local hiking and canoeing portage trails. The inspiration and wonder of the area was brought to millions around the world in 1907 when Grey Owl, arrived in Temagami, Ontario. He was employed by the Ontario Department of Lands and Forests as a ranger and the cabin he frequented still exists on the Mississagi River. His subsequent books and extensive lecturing in Britain and the United States brought tremendous attention to northeastern Ontario and the issues surrounding wildlife conservation. In 1973, The Teme-Augama Anishnabai (TAA) exercised a land caution against development on the Crown land of 10,000 square kilometres-most of the Temagami area. The attorney-general of Ontario pursued legal action against the Band for this caution. The TAA lost this court case in 1984 and the Band proceeded with an Appeal to the Supreme Court. The Band lost this Appeal and eventually the Caution was lifted. In 1988, the Ontario Minister of Natural Resources, Vince Kerrio approved the expansion of the Red Squirrel Road, directly through Anishnabe territory. This prompted a series of roadblocks by the TAA and by the Temagami Wilderness Society in 1988-1989. The Temagami First Nation’s former chief Gary Potts was the leader of the TAA blockades. In 1991 the TAA and the Ontario government created the Wendaban Stewardship Authority to decide what to do with the four townships near the logging road. The committee eventually dissolved. The Temagami land is part of the Canadian Shield, one of the largest single exposure of Precambrian rocks in the world which were formed after the earth’s crust cooled. Temagami land has striking similarities to the Sudbury Structure, which is one of the richest mining camps in the world. The hills in the Temagami, Ontario area are remnants of the oldest mountain ranges in North America that date back during the Precambrian era. These enormous mountains were taller than any that exist today. The uplifting was accomplished as enormous pressure caused the earth to buckle in a process called folding. Other processes, such as volcanic activity and geologic faulting in which the earth cracks open also contributed to the formation of these mountains. Over millions of years, these enormous mountains were gradually eroded to the land we know today in Temagami. The rocks that form Temagami, Ontario to this day are igneous, metamorphic and sedimentary rock. The Temagami area has good potential to host diamond kimberlites and more diamond bearing kimberlites may continue to be discovered in the area. The Temagami, Ontario area also contains some pillow lava about 2 billion years old, indicating that great submarine volcanoes existed during the early stages of the formation of the Earth’s crust. There are a number of northwest trending faults in the Temagami East claim block area and are associated with the Saint Lawrence Rift System and remains seismically active. The most recent felt earthquake in the Temagami area occurred in the year 2000. 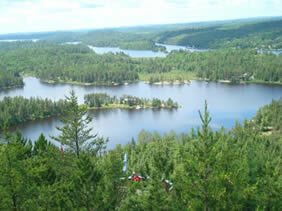 The Temagami, Ontario area provides rugged topography, which is excellent for hiking. There are numerous viewpoints in the Temagami area, including Maple Mountain, High Rock, Caribou Mountain and Ishpatina Ridge, which is the highest point in Ontario, dot the rugged landscape.